Weekly Mains Exam 2017 Answer Writing Challenge - Public Administration "MODULE- 63" | IAS EXAM PORTAL - India's Largest Community for UPSC Exam Aspirants. 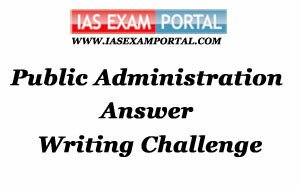 Weekly Mains Exam 2017 Answer Writing Challenge - Public Administration "MODULE- 63"
Public Administration- Paper I "Syllabus Topic – Accountability and control:: Citizen and Administration"
Indian Administration- Paper II "Syllabus Topic – Philosophical and Constitutional framework of government : Salient features and value premises "
Q2. All political tactic must be judged by standards broadly enunciated in the Constitution. Comment.